Grammy Award-winning pop superstar Justin Bieber looks all set to appear on Koffee With Karan. 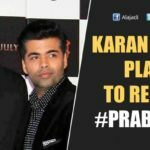 Reports doing the rounds state filmmaker-and-TV chat show host Karan Johar is keeping no stone unturned to get 23-year-old sensation on his show. The Justin Bieber Purpose Tour takes place in Mumbai on May 10 and reports coming have stated Bieber might be keen to do one exclusive interview while in the country. If things go according to plan, Johar, whose chat show has completed five seasons so far, will inaugurate season six with the Bieber episode. Apart from interviewing cream of the Bollywood crop on Koffee With Karan, Johar has conducted discussions or worked closely with several international icons including Robert De Niro, George Clooney, Hugh Jackman, Richard Gere, Maria Sharapova, Meryl Streep and Christian Louboutin. Meanwhile, Bieber landed in Mumbai on Monday in his private jet amid massive security, and at least 45,000 fans are expected to attend his concert at Mumbai’s DY Patil Stadium. Apart from police drones keeping constant watch around him, Bollywood superstar Salman Khan has loaned his personal bodyguard Shera to Bieber to monitor security arrangements at every step. If everything goes as planned, Karan, who has interviewed Bollywood stars like Amitabh Bachchan, Shah Rukh Khan, Deepika Padukone and Priyanka Chopra, will host Bieber on his show. At Wednesday’s live show, Bieber is expected to belt out all his biggest hits including Where are you now, Boyfriend and Sorry. After his performance in Mumbai, the singer also plans to do some tourist activity. He is scheduled to visit Jaipur and Agra. He is particularly keen to see Taj Mahal and sample royal cuisine in Rajasthan. Bieber is also expected to experience Ayurvedic spa sessions while he is in India and also attend a couple of exclusive, high profile private parties.